administration, America, American, American History, American president, build, church, Constitution, democracy, democratic, destruction, disaster, Donald, editorial, editorial cartoon, Europe, Europe history, european, fire, fire up, France, gasoline, historical, history, house, international, international affairs, international politics, natural, natural disaster, natural history, office, oval, Oval Office, Paris, Paris France, people, politician, politics, Presidency, president, presidential, presidential administration, Trump administration, Donald Trump, Donald Trump Twitter, Twitter, white, White House. 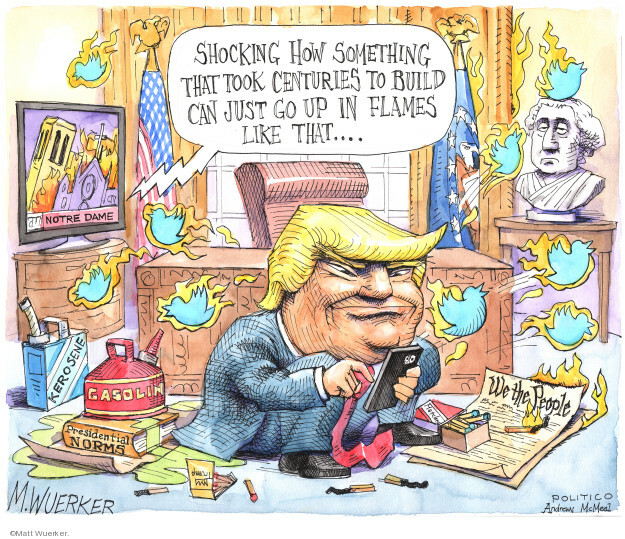 Search Matt Wuerker's Editorial Cartoons using keywords and more! Access Matt Wuerker's Editorial Cartoons by alphabetical subject.